As a former textile capital of the world Bradford has a long history of immigration through the ages - and has become enriched as one of the north's most culturally and ethnically diverse cities as a result. As long ago as the nineteenth century German merchants settled in the city (mainly in an area which was known as Little Germany), followed by Italians and Eastern Europeans (including Poles, Ukrainians and Latvians). The next immigration came from the Indian subcontinent, and in particular Pakistan. 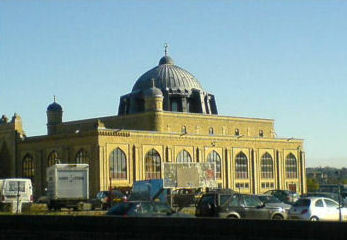 Although most immigrants came originally to work in the mills, the demise of the textiles industry (which ironically was due in part to increased competition from India, South East Asia and the Far East) led to the workforce moving to other sectors of the economy, and the city boasts a thriving Asian business community. Bradford is also base to a number of Asian culture and arts organisations, and in the summertime the city hosts an annual Mela (which is believed to be one of the largest events of its kind in Europe) - as well as the World Curry Festival ! 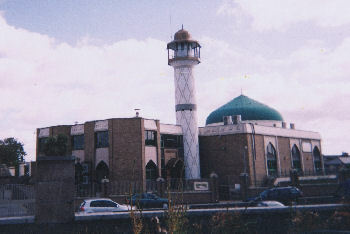 Of particular interest to the visitor are Bradford's impressive mosques (two of which are pictured above) and its famous (predominantly Kashmiri) curry houses and restaurants. There is also a range of Indian stores and markets selling exquisite saris and materials (thus carrying on Bradford's long association with the textiles trade in to the 21st Century). These include the world famous Bombay Stores - the UK's largest Asian department store !